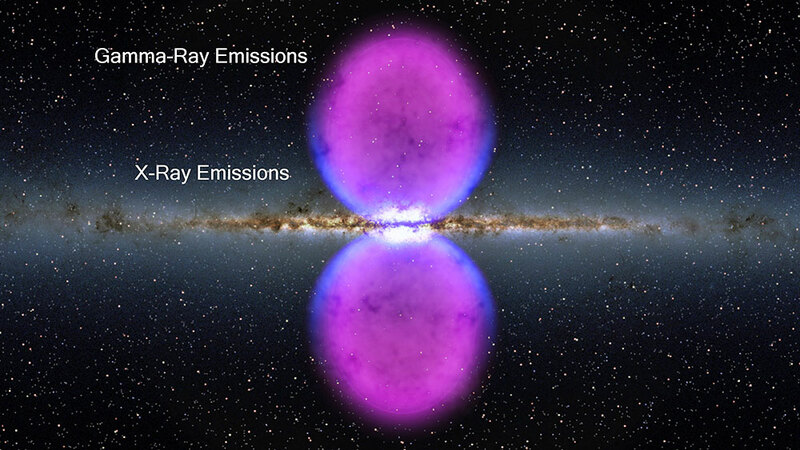 NASA has recently discovered two gigantic bubbles of Gamma waves, each of which extends about 25,000 light years out from the center of the Milky Way galaxy. They discovered this anomaly using data from their Fermi Gamma-ray Telescope. In a report dated November 9, 2010 they indicate that there are extremely energetic electrons within these bubbles, which are interacting with lower energy light to create Gamma waves. But they don't know the source of these electrons. Whatever the energy source behind these huge bubbles may be, it is connected to many deep questions in astrophysics. As per the Law of Rhythm, we have arrived at the very end of all cycles of Time. Our Milky Way galaxy has been spinning in a clockwise direction, for an astounding five billion years. A clockwise spin increases density by adding electrons, whereas a counter-clockwise spin decreases density by removing electrons. There has been a continual Battle for Freedom in this galaxy because it has not been spinning toward its source. But it has now established a new rotation, one that matches energies that are currently being instilled within its core. We live in an ‘in between' Universe where things change alright, but according to patterns, rules, or (as we call them) laws of nature. We have traveled this way before and there is much to be learned. This new rotation of the galaxy has been responsible for small pole shifts that have been occurring on all of the planets in our solar system. It has thrusted the entire system into a new formation - an harmonic convergence. All of the planets in the solar system have now returned to God's original blueprint, which is based upon sacred geometry. 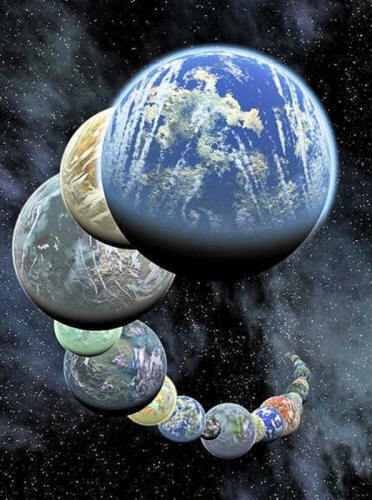 Within this cosmic movement, the axis of the Earth has been synchronized with the new rotation cycle of the other planets. Although it has not shifted to a devastating degree, its axis has shifted from its orbital plane. The planets Saturn and Jupiter are the largest in our solar system. They were the initiators of this new cycle of rotation. In the year 2000, these two planets fell into a straight line with the Sun, along with the planets Mercury, Venus, Mars and Earth. This alignment was the actual implanting of God's energies on the Earth plane. It was what started the countdown to 2012. All of the other planets have followed Saturn and Jupiter, with the exception of Neptune, which will remain seamlessly integrated. The completion of this grand repositioning took place on December 21 of the year 2012 when all of the planets in our solar system locked themselves into a new position - in a very rare alignment with the Grand Central Sun at the core of the Milky Way galaxy. This created a brilliant and coherent cosmic interaction. I think Nature's imagination is so much greater than Man's. She is never going to let us relax. A photon is a particle of Light. And our solar system has entered a Photon Belt. So we are shifting from the limited spectrum of visible light into the invisible spectrum of Ultra-Violet, X-Ray and Gamma waves. But what NASA doesn't know is that, on December 21 (2012), the rare alignment that occurred with the Central Sun broadcasted evolutionary energies throughout the galaxy. The Light waves from all of the suns in the cosmos blasted through to the Earth, which is one of innumerable planets that received this energy. And, at that time, our entire planet was enveloped in the full spectrum of God's holy light. The Cosmos is also within us. We're made of ‘star stuff'. We are a way for Cosmos to know itself. The Earth is leading the ascension of mankind. And she made her ascension on the 12-12-12 date. She is now positioned in such a way that she is drawing direct information from the Central Sun. Without such a perfectly orchestrated astronomical repositioning, universal information would remain restricted to the linear reality that currently exists. On December 21, we suddenly gained access to all points within the Universe. This has automatically opened our world to the intelligence and information that has been present on these other worlds all along. It has opened the doorways to our infinite potential. There's this tremendous mess of Waves all over in Space, which is the Light bouncing around the room and going from one thing to the other. And it's all really there! God's template holds the Light codes of the perfect Creation. And the positioning of the Earth with the center of the galaxy has allowed this template to manifest itself into our consciousness. At that time, we forever left the consciousness of this singular galaxy and became integrated into the consciousness of the Universe. Earth has become the 33rd member of the Galactic Federation of Worlds.